Our email alerts will provide you with detailed information about the visitor, their company, the pages viewed, their history, and also include research information like pre-populated links to research sites, keywords used, and any email campaign information. This method does not require you to log in to the dashboard for any of the information about this visitor. We send out the email directly to your inbox while the prospect is still on your website! With Lead Sight Pro’s instant alert system, you’ll get valuable information in real time. 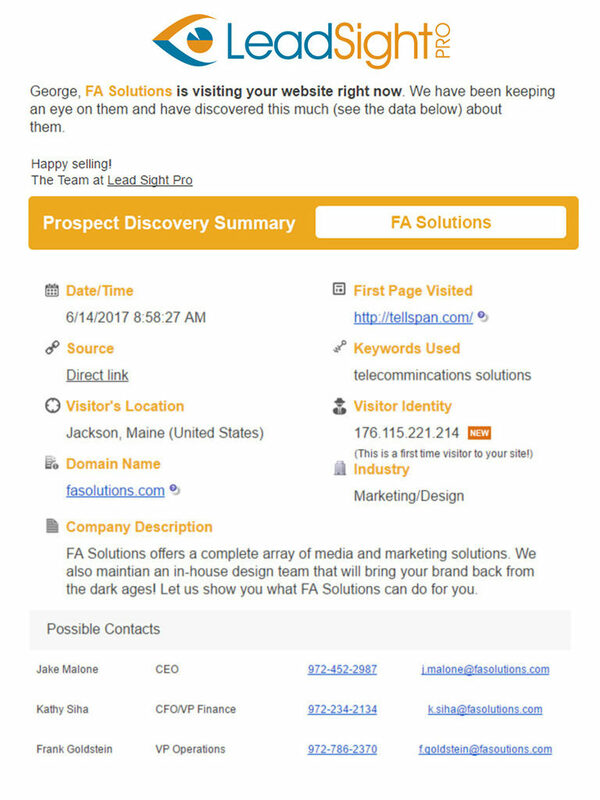 By identifying potential leads as they are visiting your site, Lead Sight Pro allows your sales team to execute the perfectly timed phone call. This will give your staff the edge over the competition as you are able to engage in the sales process earlier, build on these relationships, and close more sales. Timing can be everything when it comes to the sales process. Getting to prospects when they are in the research phase will increase your chances of closing the deal. Research shows that only 1 to 2% of all visitors will ever complete a contact form or pick up the phone to call. Lead Sight Pro can help you get the contact info of the other 98%. Lead Sight Pro is an easy, simple and automatic tool. Once it is installed, all you will need to do is follow up on the alerts that are sent to you or your sales team. We do it all with no visitor login or registration required. Using Lead Sight Pro to strengthen your current lead generation strategies will make it easier to turn those warm leads into real sales – and at $150/month, Lead Sight Pro is a must have for a growing sales team with an online presence.